Hornqvist recorded the fastest hat trick in franchise history on Tuesday night, beating Semyon Varlamov three times in a span of 2:47 in the third period as the Penguins pulled away for a 6-3 victory. 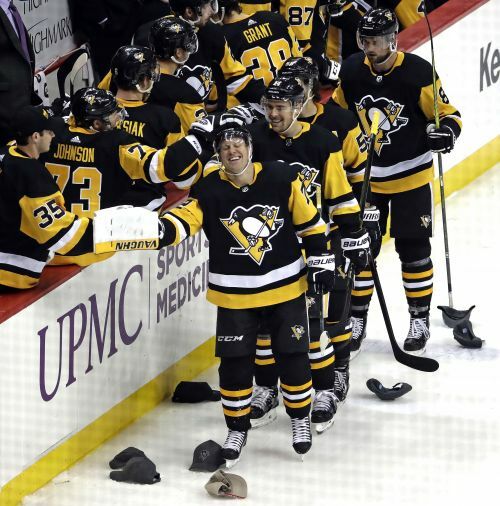 "You know what, the two last ones, they were lucky ones,' Hornqvist said after boosting his season goal total to 12. "You have one of those days sometimes, the puck is just coming right on your stick, you don't think you'll shoot and if you don't know where to go I don't think the goalie does either." The Avalanche roared back from a 3-0 deficit by dominating the second period behind goals from Tyson Barrie, Carl Soderberg and Matt Nieto. While Pittsburgh coach Mike Sullivan told his team to keep its swagger, Hornqvist understood the Penguins were in a delicate spot. The longtime Eastern Conference power is off to a sluggish start, one marred by sloppy defense and an inability to put away opponents or play well at home. Pittsburgh began the night sixth in the Metropolitan Division and just 5-6-2 at PPG Paints Arena. The Penguins spend much of the second period chasing the younger, faster Avalanche before Hornqvist went to work. "We couldn't really stop the bleeding (in the second) but you know what? We have a good group of guys in here and I think this is the turning point of our season," Hornqvist said. "It's a great third period and (if we) just keep building every single day from this day on and we'll be fine." Hornqvist's record-setting run began in typical Hornqvist fashion. The 31-year-old Swede parked himself in front of Varlamov, corralled a rebound off a Kris Letang shot, jabbed at the puck once before spinning around and whipping it by the goaltender 6:11 in the third to put Pittsburgh back in front. He needed just 1:21 to double the Penguins' advantage and completed the hat trick on his next shift when he fired a wrist shot from the slot that appeared to hit off Colorado's Alexander Kerfoot and sneak past Varlamov. "He plays the game so hard," Sullivan said. "He takes so many cross checks and he goes to the dirty areas and he competes. He just wants to win. He's such a competitive guy and tonight he had a great night for us." Varlamov made 26 stops, but struggled early and late as Colorado's six-game road winning streak came to an abrupt halt. "To be honest, erase seven and a half minutes out of that game and I liked what I saw on both sides of the puck," Avalanche coach Jared Bednar said. The Penguins needed just 7:27 to build a three-goal lead. Guentzel redirected a feed from Letang with his left skate just 2:46 in. Malkin followed just over four minutes later when he jammed home a shot from the point by Tanner Pearson for his first five-on-five goal since Oct. 30. Brassard beat Varlamov 35 seconds later the Penguins appeared to be firmly in control. It all vanished over a 5:01 span in the second. Barrie's power-play shot from the point 8:16 into the period gave Colorado a spark. Ian Cole, playing in Pittsburgh for the first time since helping the Penguins win consecutive Stanley Cups in 2016 and 2017, fired a knuckler toward the net that Soderberg managed to get a stick on and deflect past DeSmith. Nieto found a gap with the Penguins on the power play to slip the puck by DeSmith to tie the game, the seventh short-handed goal allowed by Pittsburgh this season. Hornqvist's historic stretch, however, helped the Penguins avoid a collapse while cooling off the Avalanche, at least for a night. "I think it's good for the fans, for sure, not so good for the coaches," Colorado's Mikko Rantanen said. "I think they don't like it as much. But we have to move forward." NOTES: Pittsburgh D Marcus Pettersson, acquired in a trade with Anaheim on Monday, played 13:00. ... Both teams went 1 for 3 on the power play. ... Pittsburgh is 8-1-1 against the Western Conference. Pittsburgh: Welcome the New York Islanders on Thursday.